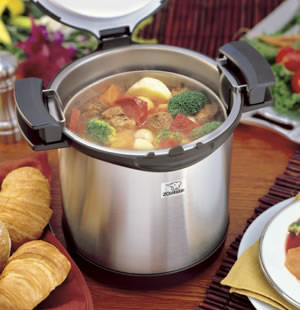 An energy-saving and safe way to cook, this Stainless Thermal Cooking Pot works like a crock pot without worrying about electricity. Just heat up the contents in the inner pan directly on the stove, place the inner pan inside the outer body, seal and the contents will continue to cook by its own heat. The stainless steel inner pan with a 3-layer bottom construction reduces scorching while heating.